The National Franchised Dealers Association (NFDA) and LowCVP have worked together to help customers at car dealerships understand that that more reliable fuel economy and emissions figures are now available to them as a result of the introduction of the new WLTP fuel economy tests. To successfully encourage motorists to drive more economical, lower emission cars, they first need reassuring that there’s now robust and reliable information available enabling them to make a better-informed purchasing decisions. The new WLTP figures provide this and, if used properly, could play a pivotal role in moving consumers towards more efficient, cleaner cars. It's important that motorists are not only aware of the new WLTP figures, but also of the benefits they offer. 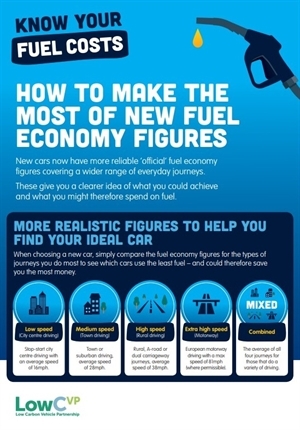 The LowCVP has been working closely with NFDA to explain the new, more reliable WLTP fuel economy figures to customers visiting participating car dealerships (most UK car sales outlets) in the UK. When choosing a new car, drivers can now reliably compare the fuel economy figures for the types of journeys they do most to see which cars use the least fuel. Motorists may be pleasantly surprised by how much difference this can make: driving 20,000 miles (roughly the average three-year mileage) in a car achieving 40 miles per gallon will cost £2,898 in petrol at today’s prices. In contrast, a more efficient 50 miles per gallon car will use £2,318 worth of petrol: a saving of up to £579 for those that opt for the more fuel-efficient car. More sophisticated testing techniques, tougher procedures and realistic ‘real world’ driving styles means that the WLTP test provides reliable fuel economy figures that better reflect how we drive now. For the first time, these fuel economy figures cover four different types of everyday journey (city centre, suburban, rural and motorway driving) plus a ‘combined’ average. By comparing the fuel economy figures for a variety of new cars for the journey they do most, motorists can ensure they choose the most economical car for them – potentially saving hundreds of pounds. The WLTP test also accounts for manufacturer options like larger wheels or a heavy panoramic sunroof which can adversely affect fuel economy. This means no nasty surprises as the actual full specification of the vehicle chosen is assessed. Sue Robinson, NFDA Director, added, “As the automotive industry continues to evolve and more vehicles come to market, it is now more important than ever that motorists select the car that best suits their habits and needs, especially in terms of fuel type. Note: Any LowCVP stakeholder organisations who believe that they could find the LowCVP/NFDA leaflets explaining the WLTP tests useful in dealings with their customers are invited to contact the LowCVP Secretariat.